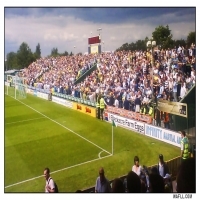 The Copse Road End here completely packed by the travelling White army in the 2008-09 Football League One clash with Yeovil Town. The Copse Road End is the stand Yeovil Town officials generally reserve for the away fans at Huish Park but that day saw the United fans take over half of the Cowlin Stand as well. It was estimated that the United fans pushed around 50% of the 6,580 total attendance that day. An early first minute goal from Luciano Becchio was a good reward for the loyal United fans but unfortunately the lead was cancelled in the 62nd minute with Yeovil scoring from the penalty spot. The League One game ended in a 1-1 draw for McAllister's Men. The record attendance at Huish Park is 9,527 which was against The Whites on the 25th of April 2008 the season before. Leeds United: Ankergren, Richardson, Huntington, Marques, Sheehan, Snodgrass, Howson, Prutton, Robinson, Beckford, Becchio. Subs: Douglas for Snodgrass, Robinson for Showunmi. Thanks to Colin Callow for this great pic.